Tiger Cub: Which filler is which? My tiger cub is loaded with filler caps and drain ports. Some of which I have mapped out but some are still confusing. The OEM manual is of little help and what spotty information I have found on the forums makes matters worse. If someone could help me to sort this all out I would appreciate it very much. There are three areas that need oil to be added. The crankcase, the gear box and the primary chain case. The chain case on the left (leg) side I have figured out. There is a side mounted filler cap and a bolt on the front of that case where the oil will weep out when enough is added. So that is all set, in my mind at least. The crankcase has a bottom drain port, which I have located and used, and a removable screen filter, which I have cleaned. The drain port has a second inner bolt connected to a tube. You remove this inner bolt and add oil until it begins to drain into this tube and down on the ground. I have removed and cleaned the oil tank. It is back on the bike with about 50% of the oil necessary already added. I Will add the rest after I complete this next step. I am now needing to top off the oil in the engine and this is where I'm stuck. My question right now is... which filler port is which. Nothing I can find maps this out. 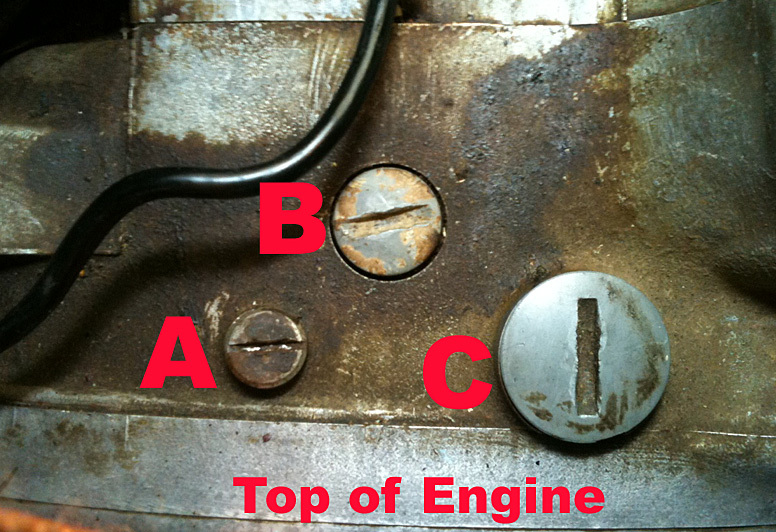 Here is a picture of the top of the engine with each of the three caps marked A, B, C. Can someone explain what each is used for, please? This leaves the filler port for the gear oil. If it is one of the above then which one is it and what method is used to know when you have added enough? "B" is the gearbox filler. "C" is where the distributor would have been on early models. Gearbox filler and drain points are shown in here - page 36 item 132. Sorry, Still not understanding this. Question: Do you add any engine/crankcase oil to the motor itself or does all of it go in to the tank and only the tank? You have Plug B as the gearbox filler port but in the diagram you offered it appears that A, the plug further to the rear and closer to the side case is labeled as item #132 (plug, gearbox filler). If not A then what is A used for? Yes and accept for one other person I was the only one posting. Not much activity, it seems, over there. That's why I came over to this site. Please don't send me away. Someone must have the answers. I'd expect to need to put some oil into the crankcase as well as the tank. Mind you I'm only familiar with T140s & on that the oil in the crankcase goes to the rockers as part fo the return to the tank. I think the A plug is a blanking plug for the cable to the gear indicator in the nacelle there is no provision to top up the crankcase . Sounds a tad scary to me. the engine is lubricated by the pressure side oil tank to engine , the oil in the crankcase has done its work and is just waiting to be returned to the tank.the only part not lubricated is the rocker gear ,and the two or three minutes till the pump starts scavenging doesn't appear to have any ill effects. do not rev the engine over a fast tickover until oil is returning to the tank. Fill it up, remove the spark plug, engage top gear and push it up & down the street to get the oil circulated before starting.